The lighting of the Eiffel Tower has always been important, because of the size of the building to illuminate. During its construction electricity was widespread, but not enough to be fully used, the Eiffel Tower was lit by gas lights, they were numerous enough for visitors to roam without being too dark. There were still spotlights, and especially a lighthouse at its peak, a bit like today. Then the Eiffel Tower undergoes regular transformations. The first important transformations took place for the 1900 World Exhibition, 11 years later, for which Eiffel spent its entire turn on electric lighting. Finally there was no gas on the monument, a particularly dangerous product. In 1937 took place another world exhibition (which did not bear this name, but it was its equivalent). On this occasion again the lighting of the tower was modified with the addition of a multicolored luminous globe under the first floor. It was also the first time the tower had taken on special colors: This year, it was painted blue, white and red. It was in May 1958 that the lighting was further improved. This time she was taking light from powerful searchlights all around the tower, in pits. This light was already worked, the building stood out better. these projectors remained until 1985, the year of the end of the tower renovation, which saw a new lighting be installed. It is this one that is in place today, a large number of projectors illuminate the metal structure of the interior. The usual lighting of the tower should not be confused with the play of light that takes place from dusk to 1am, for 10 minutes, every day: This effect is no longer considered an artistic show, which Moreover, it had to be temporary but remained, the visitors asking for it again. The current lighting of the Eiffel Tower dates from 1985, it is the last modification in date of the illumination of the monument. It is characterized by a warm yellow-orange light. The new lighting consists of 336 sodium floodlights installed in the structure of the tower, which gives it the golden light of the most beautiful effect. It is therefore an internal lighting of the tower. These projectors were changed in 2007, in 2011 and in 2015, since they have a lifespan of 4 years. It consists of 336 high-pressure sodium projectors that provide arranged along the joists of the tower, they are oriented so as to project cones of light on the important points of the structure, but also to illuminate the parts specific to the visit. It is therefore not only an aesthetic utility, but also practical. This new lighting is automatic, sensors trigger it at dusk. It takes about 10 minutes to ramp up. Il faut aussi voir que cet éclairage est le premier de la tour à être considéré comme une oeuvre d'art en lui-même, indépendament de la tour. Il a été conçu par Pierre Bideau. Le public a pu l'apprécier pour la première fois le 31 décembre 1985. The twinkle of the Eiffel Tower, which is a spectacular light effect, is not a lighting in itself, it's just a temporary sight. It appeared for the first time on December 31, 1999 for the transition to the year 2000. the new lighting embellished the Eiffel Tower: It is a flicker of the most beautiful effect, which will be stopped on July 14, 2001, more at the planned end of this enlightenment project. But that was without counting on the success he had with the public who claimed him again. It was therefore necessary to change the bulbs while doing structural work on lighting because it had not been planned to hold more than a year, and now it was to keep it at least 10 years! The glittering resumed by popular demand on June 21, 2003. In 2012 it was reduced from 10 minutes to 5, which allows to consider exceeding 10 years, and fortunately also because in 2012 a call for offer was launched to change this illuminations, to move on. The mayor of Paris, however, warned candidates that the new project should be an extension of the flickering, it is still very popular with the public. The flicker starts at the beginning of each hour, every day, from dusk to 1am, for 5 minutes. The start of 1am, the last, is special. It lasts 10 minutes and unfolds while the tower is off, which gives it a completely different aspect. Technically, the illumination is caused by 20,000 bulbs with a power of 6 W, a set of 120,000W. Except that the actual figure is far below, since each bulb is not constantly lit. There are 5000 bulbs per side. These bulbs are put in small translucent protective boxes, fixed on a metal plate itself attached to the structure of the tower. There are everywhere on the faces of the monument, we see them well when on the 2nd floor because on the balconies of this floor, the tower is curved, when looking up. To connect all the boxes it took 40 kilometers of cables, which is still a lot, each bulb having 2 connectors. And as each bulb is fixed with 2 fasteners, it makes a total of 80,000 additional metal parts that have been installed recently on the Eiffel Tower, or 60 tons more. To feed all that we needed 230 cabinets and power boxes that were installed in 5 months by 25 climbers electricians. The flicker budget was 4.55 million euros. The lighthouse of the Eiffel Tower is the gigantic rotating light ray that rises at the top. It was designed echoing the lighthouse that was already on the tower in 1889, at the time of its construction. It is also quite similar to him. The current lighthouse was first started on December 31, 1999. It consists of four "marine" projectors arranged in a square, each being rotated 90 ° with respect to its neighbors. Motorized and computer controlled, they are equipped with xenon lamps and a large capacity cooling system, their temperatures rising very quickly. The range of the lighthouse is 80Kms, roughly equivalent to the original lighthouse (see below). Only two headlights are used at the same time, which is why the light beam is straight, seeming to cross the top of the tower, but if we look closely we see that each lighthouse is fixed, but can rotate on itself. When it reaches 90 °, it turns off and its next comes on immediately. As this ignition-extinguishing process is instantaneous, one has the impression that it is only a single lighthouse turning around the tower. During the last years the Eiffel Tower has offered several new dresses, which it has unveiled on various occasions. They all took the form of illuminations specially designed for these events, and were only seen for a relatively short time. We can mention the year 2009, which saw celebrate the 120th anniversary of the construction of the Eiffel Tower. For this occasion, each evening, after the usual 5-minute glittering illumination, every hour, it was proposed to the public to see a light show evoking the construction of the tower. Through very strong and striking effects, the artist-designer of the show unveiled the various stages of construction through games of lights worked and dynamic. It was 12 minutes long and was projected from November 22 to December 31, 2009. In 2007, two years ago, the Rugby World Cup was held in France. For this occasion the Eiffel Tower projected on its flank rugby poles in the center of which passed a ball of 13 m long, simulating a penalty. Here again the effect was striking, and very temporary, the competition only lasted a month and a half (September 7 to October 30). In 2008 the Eiffel Tower was illuminated in blue, with the 12 stars of the European flag on its North face. This visual effect was realized on the occasion of the French Presidency of Europe, from June 30 to December 31, 2008. It had already been implemented on May 9, 2006, for the day of Europe. A few years ago, in 2004, the Eiffel Tower was lit up in red to celebrate the Chinese New Year. The illumination took place from January 24th to 29th and stayed on all nights during this period. Note the presence in France of the Chinese Minister of Culture, who took part in the festivities. On October 7, 2014 the Parisians were surprised to discover that the Eiffel Tower was illuminated in pink, an unusual color. She stayed that way all night to spread the word about "Breast Cancer, Let's Talk About It", which launched its annual October campaign that day. It aims to raise awareness about the risks of breast cancer, as its name suggests. Each year it is a Parisian monument that is the focus of this association, and in 2014 it was the Eiffel Tower, after the Opera Garnier or the Montparnasse Tower. In 2009, the Turkish season took place in France, from June 2009 to March 2010. On this occasion, the Eiffel Tower was illuminated with Turkish colors between 5 and 11 October. She had red on the lower part and white on the heights. 2015 was a great year for the various lights of the Eiffel Tower, but unfortunately not for pleasant reasons. Following the bombings of November 13 the Eiffel Tower is adorned with a color Bleu-Blanc-Rouge as a tribute to France's 130 victims. These attacks allowed the French to reclaim their national colors, and their presence on the Eiffel Tower was welcome. It was also during these events that the tower was extinguished, the time of an evening. A few weeks later, in 2015 the COP21, the 21st International Summit for Ecology was held in Paris in late November and early December. On this occasion the Eiffel Tower took the green color. A mobile application allowed visitors, for a small fee, to grow a flower on the monument. At the validation of the payment of the spotlights made a play of lights showing a plant to develop until the flower shoot. It was very original and a real success. October 2015 was also the moment for the celebration of the 130th anniversary of diplomatic relations between France and South Korea. Here too, to please our guests, the Eiffel Tower has been illuminated with the colors of Korea, during a sound and light show on pop music. In March 2016 terrorism is striking again, in Belgium this time. The day after the Eiffel Tower is adorned with the colors of the country in memory of the victims. The Administration of the Exhibition, in order to increase the splendor of its festivities, had enlightened the Tower every evening with the help of a large number of gas burners arranged in globes of opaline glass. These globes, spaced approximately 0.35 m apart, formed light cords arranged on each platform, on the bases, as well as on the periphery of the large arches of the base. All of this enlightenment was extremely happy. In addition, on certain festive evenings, one or more conflagrations were made with 100 red Bengal flames, placed on the different floors of the Tower. The effect of these flames, surrounded by torrents of red smoke, in the midst of which the metal frame was clearly illuminated, produced a grandiose and fantastic impression, of which all those who attended preserved the memory. 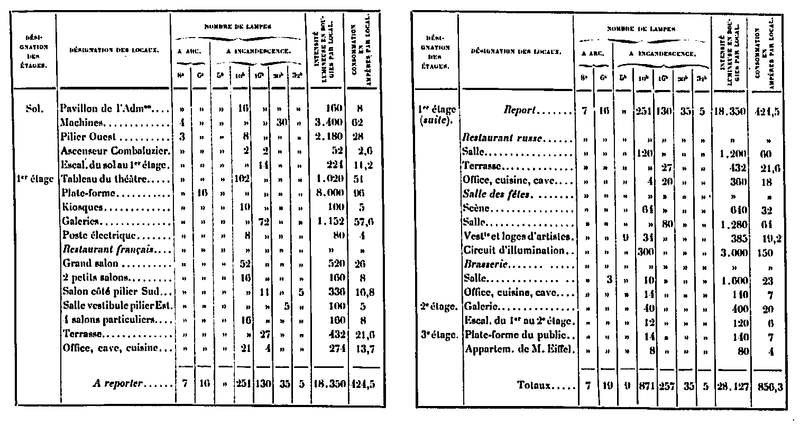 For a period of 3.5 hours and a price of 0.15 francs per m 3, the daily expenditure was 1,475.25 x 0.15 = 221.29 francs, and for 188 lighting days: 41,604.00 francs. The labor costs of the lighting were 350 francs per evening, or 65,800 francs as a whole. During 35 evenings, there were 72 conflagrations which, at the rate of 900 francs each, gave rise to an expenditure of 64,800 francs. 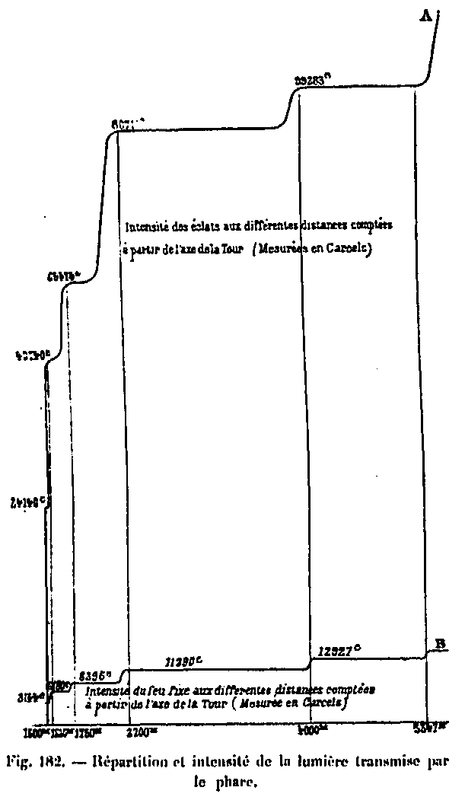 The totality of all the expenses of illumination amounted to 212 204 francs. At the construction of the tower the electric lights and the lighthouse were supplied with electricity by a dynamo mounted on a heat engine. Here is how they are described in the book 'The tower of 300m', by Gustave Eiffel. Click below to see the text about the detail of the tower lighting in 1889. The lighting of the Tower is provided by two engines pestle compound, operating by belts two gram dynamos 6-pole type S Marine, the house Sautter and Harlé. Each engine has a nominal power of 60 horsepower, but currently gives 70 horsepower. His speed is 350 rpm. The steam is admitted at 6 kg pressure, and the amount that is consumed by each of the engines is 640 kg per hour. The diameter of the small cylinder is 260 mm and that of the large cylinder 380 mm. The common race is 200 mm. These engines are variable trigger for both cylinders, and the distribution is of the Meyer kind, as well as the regulator system. As for the dynamos, each gives 820 to 850 revolutions per minute, counted by a Bush tachometer. It can supply 600 amperes at 70 volts. The two dynamos thus supply 1200 amperes which, at 70 volts, give 84 000 watts corresponding theoretically to 84 000/736 = 115 horsepower, and practically to 84 000/660 = 127 horsepower of 75 kgm. This is the total electric power of the Tower. The 6 poles of the machine are wrought iron, and the polar masses of cast iron. The gram type armature has a diameter of 0.65 m and is formed of 120 turns, which lead to the same number of collector blades, red copper. The compound excitation was adopted, and the setting of the brushes is 1/6. Machine Room: Terminals of the dynamos, the cables are directed on a board carrying two switches with two directions to pass the current of a circuit, that is to say 600 amps, on one or the other dynamos; the negative pole is common. The two cables of each circuit are then connected to the distribution board. This includes: Two circuits supplying the 1st floor, the circuit of the headlight, the circuit of each projector and the circuit of the machines. A voltmeter and an ammeter make it possible to check the electromotive force and the intensity at any moment, and to make sure that the dynamos are not too charged. 1st floor: The two main circuits that lead the current to the 1st floor are brought into a special room and connected to the terminals of tables on which all the lighting of the Tower has been gathered, except the engine room and the two projectors. All lines are equipped with an ammeter, a circuit breaker on each pole and a switch. We can follow the progress of the lighting and immediately isolate the part that works poorly, without interrupting the light of other premises. The voltage of the main circuits is indicated by a Thomson voltmeter constantly in circuit. Security Device: The total power consumption is indicated by a 600 amperes Richard ammeter. Each group of rows united on the boards can not exceed the power of a machine. In the event of an accident at one or the other of the circuits, and so that the lighting of the rooms of the 1st stage is always assured, one of the two circuits was placed on a reversing switch. In this way, all the lighting can be switched on at one circuit or at the other; beforehand, care is taken to cut several lines, so as not to exceed 600 amperes. If an accident occurs on the machines, the lights are turned off at the lighthouse, the spotlights, the theater board, the lighting circuit of the village hall and the 1st floor gallery; the power is turned on the machine and all the rooms are left alone. The cables are bare or insulated and mounted on porcelain insulators. The two main circuits, those of the headlight and the projectors, are mounted on bell insulators. On the machines, the cables going from the switchboard to the dynamos are placed under moldings and tarred; this extra care was taken to avoid moisture from condensation of steam or other causes. The isolation thus obtained is perfect. The section of the cables is calculated so that the intensity does not exceed 2 amperes per square millimeter. The illumination of the the Combaluzier Lift of the West Pier, which operates alone at night, could not be obtained by the Renard batteries and then Julien accumulators with immobilized liquid; a special provision has been employed which has been satisfactory for three years. The current was brought to the middle of the race of the cabin by two motionless wires; at this point, a flexible cable is connected, the other end of which is connected to the cabin and follows the movement of the latter. To ensure the tension of this cable, it was passed over a pulley carried by a small 20 kg trolley which rolls in a sheath. The entire installation is branched, the potential of 70 volts does not allow to mount the arches by two in tension. The following table shows the breakdown of lighting by premises. The amperage intensity of the electric current required for arc lamps and incandescent lamps is therefore 856.3 amperes, plus 100 amps for projectors No. 1 and 100 more for projector No. 2, and finally 100 for the lighthouse, we get 1156.3 amperes, which are supplied by two dynamos of 600 amperes. The projectors, two in number, are placed on the 4th platform. They are Mangin type, 90 centimeters in diameter, adopted for the defense of the coast. They rest on a pebble base and can be moved quickly on a circular Decauville lane, prevailing around the perimeter of the platform (see Fig. 180). These devices, as well as the upper lighthouse, are established by the house Sautter and Harle. Each of them is powered by a current of 100 amperes. The refractive mirror of Colonel Mangin, who gave his name to the projectors, is limited to the anterior part and the posterior part by two spherical surfaces having the same axis, but two different centers. The posterior part of the mirror is silvered, so that the light projected by the source, on the mirror, undergoes both the effects of reflection and refraction, through its passage in the thickness of the glass. The system is equivalent to a spherical mirror, in front of which would be a divergent spherical lens. The spherical aberration by reflection of the concave mirror can be corrected by the spherical aberration by refraction of the diverging lens. The radii of curvature of the concave and convex surfaces of the mirror are determined for this purpose. 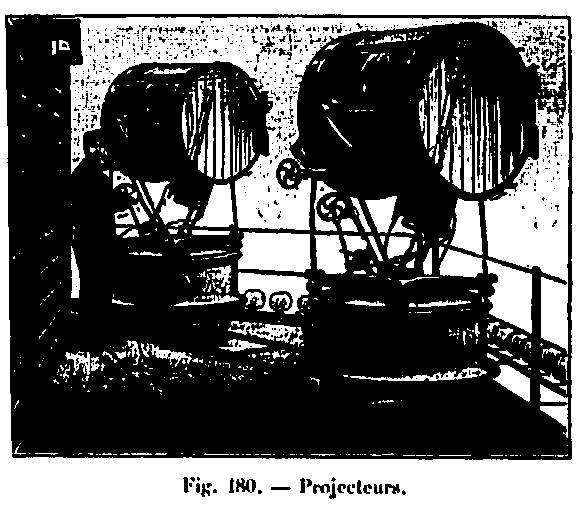 Each of the projectors is mobile around a horizontal axis; one can make him describe a main plan of the Tower, so that any point of the horizon can be easily targeted. In addition, they can be oriented in any plane. On the tower, the inclination of the projectors is possible up to 45 °, for the lighting of the neighboring points. The divergence of the beam is obtained simply by moving the light focus. The electrical source of each projector can be represented by a luminous sphere 8 mm in diameter, so that the rays are not rigorously returned in the same direction. They have an angle of divergence that can be calculated since it is equal to the angle of 1.3 ° under which we would see the sphere if we could place the eye at the top of the mirror. Despite this divergence, the density of the beam is substantially the same from the center and walking towards the edges. The optical power therefore varies as the square of the opening of the mirror. If one places oneself in suitable conditions of observation, with the help of a night-bin one can distinguish, in clear weather, the details of the monuments, up to a distance of 7 to 8 km. All the monuments of Paris are visible; we can also follow, on the Seine, boats during their journey in Paris. In order to prevent the agitation of the air from mechanically disturbing the flame, the projectors were covered with a plane ice perpendicular to the axis, which the rays, made parallel, traversed consequently without appreciable loss; but, as the quantity of heat developed is considerable, this ice has been divided into a series of blades independent of each other, so that there is no need to fear that the considerable warming which takes place in the hearth causes break. This is the description of the original lighthouse, the one that was put in place during the construction of the tower. This lighthouse has been dismantled, and nowadays it is another that sweeps the Parisian sky every night. Above the four large upper diagonal beams is the floor of the lighthouse, which offers a large number of interesting features, which we will recall from an article published in the Civil Engineering by Mr. Bouquet, engineer of the house Sautter. 1. By a dioptric drum 60 cm inside diameter, comprising five rings and the type adopted by the French Administration for electric headlights. 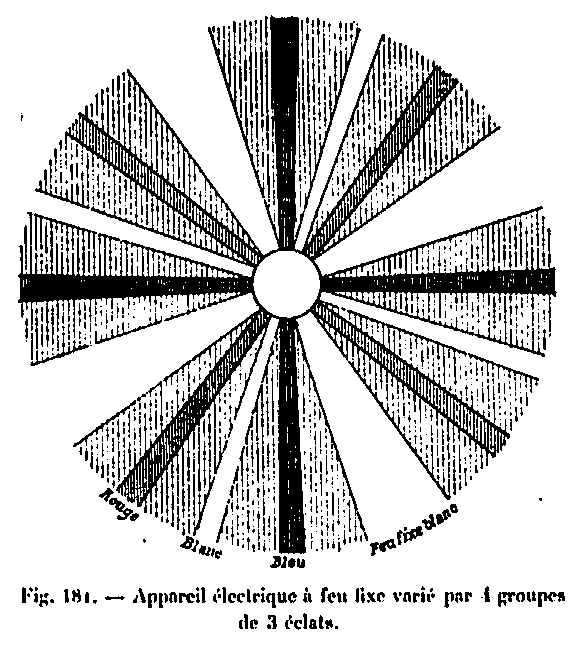 The luminous focus is placed in the axis of the main ring, which is the second in descending order; it was not considered necessary to prolong the drum much above, the voltaic DC arc giving the maximum of light at 40 ° below the horizontal plane passing through the center of the hearth. The drum sends its light to the horizon and concentrates it in an angle of about 1.5 ° aperture. 2. By five catadioptric prisms calculated to distribute the light at an angle of about 12 ° below the horizontal; thanks to these prisms, the lighthouse can send its rays to 1500 m from the Tower. This arrangement of prisms with great divergence, necessary because of the altitude of the lighthouse, had not been used hitherto; it would be pointless for the sea lighthouses that send all the light to the horizon. The large ray dispersion angle (-12 °) that it was interesting to obtain to make the lighthouse visible from 1500 m, therefore required the calculation and special size of the five catadioptric prisms. The ensemble that we have just described constitutes a fixed fire, that is to say a fire illuminating uniformly over the entire circumference. The mobile device, concentric to the first, is intended to produce the chips. It consists of four groups of three vertical lenses (Fig. 181); these lenses are plano-convex; they all have the height of the fixed optics and they concentrate the light by increasing its intensity in the proportion of 1 / 7.68 is about eight times. The color of the chips is produced by colored glasses placed in front of the vertical lenses. The succession of splinters is as follows: red sparkle, white sparkle, blue sparkle, white steady fire, red sparkle, white sparkle, etc. The maximum intensity is white. These lenses are attached to a moving drum that goes around the fixed optics in about 90 seconds; the rotation movement is imparted to it by a small electric motor provided in the upper part and pressing by means of a pinion gear attached to the movable drum. The very low energy consumption that the motor (0.5 amps at 50 volts, or 25 watts) is taken in parallel with the lamp circuit; a rheostat interposed on the bypass makes it possible to adjust the speed of the motor and consequently the duration of the splinters. In the catadioptric rings, the light is distributed unequally and in such a way that the different illuminated regions receive a greater and greater light intensity as one moves away from the Tower. Curve B of FIG. 182 indicates the distribution, in a vertical plane, of the light transmitted by these five catadioptric rings; the rays emitted at the widest angle with the horizontal plane meet the ground at the nearest points of the Tower in the illuminated region and are the least intense. The first zone, illuminated from 1,500 to 1,520 m, passes behind the Military School, Lowendal Avenue and Place de Fontenay, at the corner of the Avenue de la Tour-Maubourg, crosses Avenue Montaigne, the Avenue de l'Alma at the corner of Pierre-Charron Street, skip the Lycée Janson and pass instead of Passy. The second zone, from 1,520 to 1,750 m, passes over the dome and the Esplanade des Invalides, the Invalides bridge, the street and place Francis I, at the place of Eylau, the church Saint-Honoré, at the rue de la Pompe in Passy, ​​at the Grenelle bridge. The third zone, from 1,750 to 2,200 m, is bounded by a circular arc that passes to the Bourbon Palace, crosses the Champs-Elysées at the Cirque d'Été, cuts the Rue de la Boëtie, begins the avenue Friedland, passes the Place de l'Etoile at the beginning of Wagram Avenue, cuts Avenue du Bois-de-Boulogne, near Porte Dauphine, razes the fortifications, crosses the park of Muette, the district of Grenelle at the town hall of the XV arrondissement, the well of Grenelle, the Ministry of Commerce, and finally arrives at the corner of the Ministry of War. The fourth zone, from 2,200 to 4,000m, is bounded by a circle that crosses the Louvre courtyard, the center of the Palais-Royal, the Boulevard des Italiens at the corner of rue du Helder; passes behind the Opera, Place Tivoli, boulevard des Batignolles, behind the college Chaptal, Place Wagram, out of Paris at the gate of Courcelles to return to Point-du-Jour, out again to return to the door of Placentia , cross Vaugirard through the rue de Vanves, the Montparnasse cemetery, the garden and the Luxembourg palace, the corner of La Monnaie, where it crosses the Seine. The fifth zone is limited to 5,347 m by a circle passing the Saint-Louis bridge, the Lobau barracks, the rue du Temple, the intersection of Turbigo and Saint-Martin streets, the Renaissance theater, the Montholon Square, at Trudaine Avenue; he leaves Paris at the Place Clichy, crosses Clichy, Courcelles and joins the Seine at the Pont de Neuilly. He returns to Paris by Issy, Vanves, Malakoff and the Porte de Montrouge, and comes to the Seine crossing Arago Boulevard, Boulevard Port Royal, Rue Monge at the corner of the Ecole Polytechnique. Curve A gives the luminous intensities of the flakes corresponding to the five catadioptric rings in the five preceding regions. The luminous intensity of the rays emitted on the horizon by the dioptric drum being 70,000 carcels, this intensity becomes in the fragments, whose amplifying power is, we said, of 7,68, 540,000 carcels surroundings. For 500,000 carcasses, the range of the fire on a clear day would be 203 kilometers; but the sphericity of the globe greatly limits the geographical scope. At a distance of 300 m from the lantern of the Tower, this range is only 70.2 km. Taking into account refraction, an observer at the 300 m elevation can see the lighthouse at a maximum of 141.2 km. See Visibility from the top. The observations made so far and reported by the Press, indicate as points from where the lighthouse is visible: Chartres (75 km); Fontainebleau (60 km); Provins (77 km); Orleans (112 km). Arc Lamp: The lamp of the headlight is of the mixed type automatic or by hand, for a current of 100 amperes. The maneuver is done from the bottom of the optics; three threaded rods controlled by a steering wheel and gears allow raising or lowering the lamp. The focus of the voltaic arc is obtained by a lens prism, with total reflection, placed along the optical axis of the drum, but outside. The image of the coals is projected on a screen arranged at eye level for the lighthouse keeper; a marker makes it possible to bring the image exactly to the point, that is to say the arc to the focus. Let us add finally that the lighthouse of the Tower has, by its position and its power, the maximum range of all the lighthouses of the world. The initial lighting of 1889 was partially made from gas spout, put in glass globes, for safety. They made enough light to move and illuminate the monument, but the main light was made by two projectors located at the top of the tower. But in 1900 electrical techniques were even more developed than during the previous decade, so he could do the lighting of the Eiffel Tower only through electricity. For that he used 5000 light bulbs positioned on the sides of the tower. In May 1958 the lighting of the Eiffel Tower is modified, it now takes much of its light from pits located around the monument. These facilities remained on site until 31 December 1985, at the time of the renovation of the tower. This new lighting consisted of 1290 projectors, and it therefore has the characteristic of lighting the Eiffel Tower from the outside.